« Socialism in the Modern World, Part V: With 162+ Choices, How Many Nations Qualify? It’s just so basic. The reasoning for this is so ludicrous and it takes so little thought, not really even critical thought, to debunk something as insipid as welfare for those who refuse to contribute anything. How are these socialists to be taken seriously with lunacy like the GND? NedlandP, you make very valid points. On a separate topic, are you a fan of hot sauce and/or hot peppers? Many of us on the right want an improved safety-net and tax code. Social Security is one example: A UBI of $10,000 annually would mean that Social Security becomes (the current SS benefit – $10,000). With seniors not totally dependent on SS, they might consider private accounts for the rest, and you might be able to accelerate increases in retirement age, to combat the demographic nightmare coming. Growth in citizen population who would receive a UBI is 0.9%. If the UBI matches inflation, that 0.9% is a low bar for GDP growth to beat. Means the economy is growing slower than entitlements. The Dan Mitchell program. Those on the Left want to give away the money of other people rather than their own. The original argument was that “people would work less”. They didn’t work less, which is actually surprising; since many might start businesses, educate themselves, take more time like staying with children and elders who needed help, or just be lazy. Instead, the goals posts were moved. The new claim is that “people didn’t work more”. That was never expected, especially if they cut of the program after two years. You wouldn’t see the effects of new businesses and education, in a two year program. The target group was an “unemployed” 2,000 people rather than a cross-section, while the “control group” was 190,000. It was designed by politicians who had an agenda, rather than researchers. Very suspect methodology. If you could have a UBI of $1.00 and a flat tax, every reader of this column would be for a UBI. If you proposed a UBI of $20,000 per adult on top of the current safety-net and tax code, almost all readers including myself would be against it. So we’re talking about degree. Whoops, no, we are not talking at all. We should be discussing whether a moderate UBI could replace disincentives in the current safety-net, and maybe rewrite the entire tax code. We go from welfare queens to unemployed vets surviving on the streets. In both cases, welfare and government have failed. Unemployment benefits face a hockey stick, for those who would might work if the incremental amount more that they would make doesn’t compensate for the extra hassle, until their benefits end. We have policemen and firefighters going on disability at appalling percentages just when they’re ready to retire. — But no, the current system is fine. Under a moderate UBI and a flat tax, the effective tax rate could go smoothly from negative to the flat rate, with every increment in income resulting in additional income and an incremental increase in the effective tax rate. Cut all tax deductions, since the UBI would act as a replacement. While this might help the middle class a little, and hurt the wealthy a little, if people didn’t have to waste their time filing out annual tax forms, everyone would benefit, especially the wealthy. But no, we don’t want to make the system more efficient, while we spend 70% of our non-interest government budget on transfer payments, while being concerned that that idiot AOC said “unwilling to work”. Wake up! We’re already shelling out TRILLIONS. We’ve got those trillions to work with to design a better system, while eliminating about 1 million bureaucrats. We will not wake up tomorrow and find that all current safety-net spending is gone, unless we can replace it with something better. 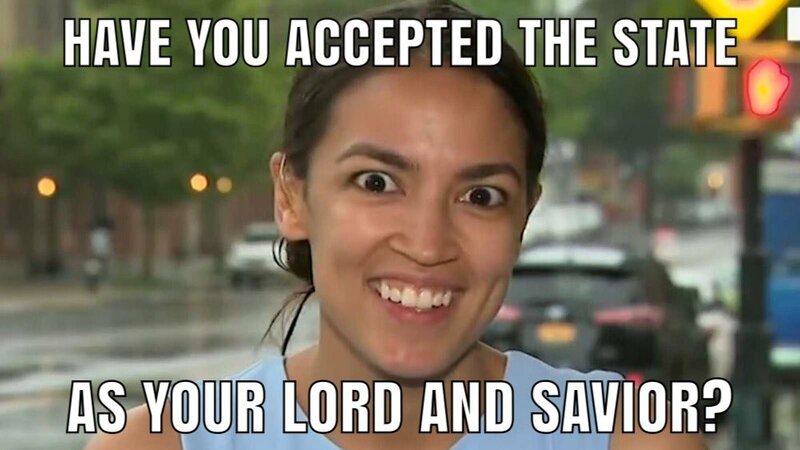 If you want to stand your ground, don’t be surprised if some wild-eyed socialist, like AOC, proposes something far more extravagant. You won’t have even considered it, so you could have posed a counter-argument. Dan, you said yourself that in many ways we are a socialist country. Right now we are structured so bureaucrats decide. Under a moderate UBI, the people would decide. How does one get the farmer to get up before dawn and work the farm until dark to get the foodstuffs on the way to the supermarket if all he had to do was go to the store and get whatever food he wanted for free?